Democratic incumbent senator Joe Manchin is denying the existence of his own internal memo circulated when he was governor of West Virginia. The memo requested a $3 million personal "Governor's Helicopter" to be purchased with opioid funding. 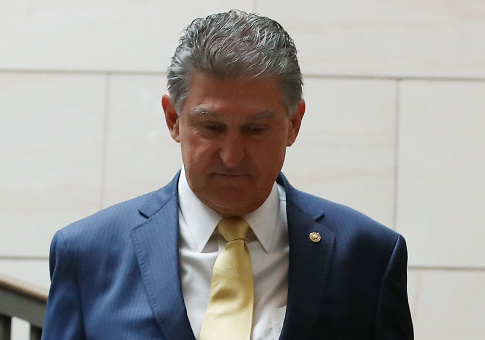 Manchin laughed and accused his Republican opponent Patrick Morrisey of being a "liar" for citing the Washington Free Beacon report, which revealed Manchin's request for a personal helicopter raised a "RED FLAG" in his office. Manchin's agency head warned the governor to "beware of public perception and awareness." When asked about the report Tuesday, Manchin called Morrisey a "liar." "He knows it's so false. You know what? Patrick Morrisey wants to call everybody a liar, and the only person that's lying is Patrick Morrisey," Manchin said, according to the local CBS affiliate in Huntington, W.V. Manchin's campaign did not respond to request for comment on whether Manchin is calling his own governor's office memo, which was sent by his chief counsel, a fabrication. Manchin's comments came during a press conference where he accused Morrisey, the state's attorney general, of accepting a nonexistent drug settlement from McKesson Pharmaceutical. Manchin said a $35 million settlement would not be enough, and West Virginia "won't be bought off for pennies on the dollar." There is no settlement agreement with McKesson. The deputy attorney general's office told CBS WOWK, "Contrary to Manchin's statements, we have received no offer." "Anything said to the contrary is utterly dishonest and furthermore ignores that within hours of its filing, Attorney General Morrisey voluntarily recused himself from the McKesson matter and has not been involved in the case since," a chief deputy attorney general said. West Virginia did, however, accept an opioid settlement of similar monetary size while Manchin served as governor. Purdue Pharma settled for $44 million in 2007 for misleading consumers about the addictiveness of OxyContin. At the time, Manchin's office was taking "the lead" on how to spend the funding, which was intended for drug enforcement, but noted that the governor wanted to "think out of the box a little bit." Thinking outside the box led Manchin to request a personal "Governor's Helicopter" at a cost of $3 million to West Virginia taxpayers. Manchin's staff wanted to know how they could justify using opioid settlement funding for the personal purchase. "Governor wants settlement funding dedicated to purchase a new helicopter," the memo circulated by Carte Goodwin, Manchin's chief counsel, states. "This request needs not only to determine the ability to fund, but under what circumstances would a helicopter be allowed under the stipulations of the settlement. Call me if you have questions or this doesn't make sense. $3 million." Norbert Federspiel, the then director of West Virginia's Division of Criminal Justice Services, responded that the request raised a "RED FLAG." Ultimately, the office did not heed Manchin's request. "First off it cannot be the Governor's Helicopter," Federspiel said in a note attached to the request. 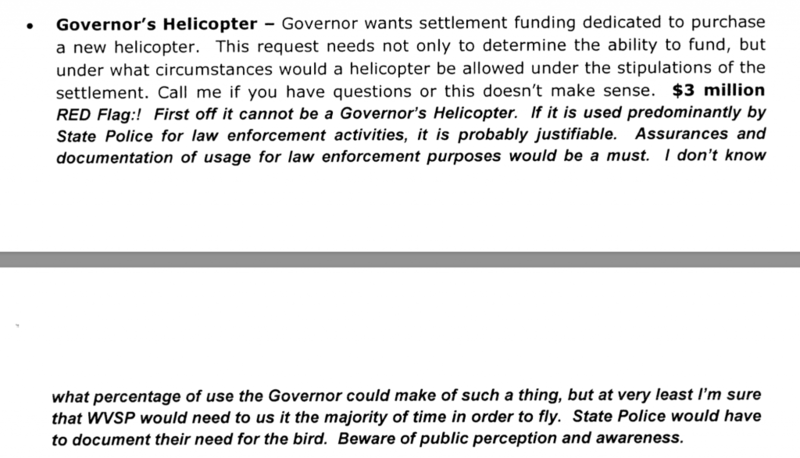 "I don't know what percentage of use the Governor could make of such a thing, but at very least I'm sure that [West Virginia State Police] would need to us [sic] it the majority of time in order to fly," he said. "State police would have to document their need for the bird." "Beware of public perception and awareness," Federspiel added. Opioid overdose deaths nearly doubled in West Virginia under Manchin's watch. This entry was posted in Politics and tagged 2018 Election, Joe Manchin, Opioids, West Virginia. Bookmark the permalink.